Three of our Yorkshire Terrier moms had puppies in April and May 2012. Brangie (x Josh) gave birth to 3 Yorkie females and 3 Yorkie male puppies on the 2nd of April 2012. Alaina, Alexis, Flower, Albie, Lex and Benji - you were a busy bunch of Yorkie puppies, the house is very quiet with you all now gone and with your new owners! Bienkie (x Levi) gave birth to 2 Yorkshire Terrier females on the 6th of April 2012. Both puppies looks exactly like their mom. We decided to keep little Bea in our Yorkie family - herewith a photo of her. My gorgeous and treasured yorkie mom Yasni (x Levi) had 2 Yorkie male puppies and 1 Yorkshire Terrier female puppy on the 19th of May 2012. Yasni is Bienkie's mother Bea's grandmother. I wish I could have kept this little female too! 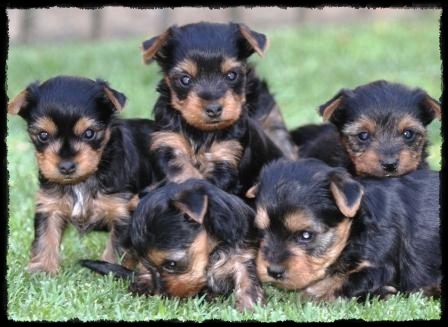 They are all gorgeous Yorkshire Terrier puppies and each Yorkie found his/her forever home.